Payroll ToolKIT is designed to relieve companies using Timberline Software of the burden of payroll administration without sacrificing job costing. Why use Keystone's Payroll ToolKIT? Whether you're presently processing your Timberline Payroll in house or outsourcing it, Payroll ToolKIT provides the tools to process and manage your payroll more efficiently. You are free from the burdens of weekly payroll processing. There is no complex transition from in-house processing to outsourcing; you do the processing one week, Keystone does it the next. Financial data flows to the proper jobs and GL accounts as soon as the payroll is posted, without the need of third party software. Your Timberline tax and union tables are maintained and tested by experienced personnel, minimizing the chance for error. What makes Keystone Payroll Toolkit so revolutionary? 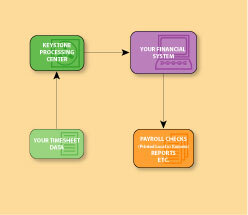 Keystone Information Technology is revolutionizing the way Timberline Users manage their payroll. Keystone's focus is on trade businesses like your own. We understand that to properly manage your business, you need integrated and timely payroll and job costing information. That's why Keystone developed the Payroll ToolKIT, a service that outsources the processing of your payroll while keeping all of your data on your Timberline System. It uses the power of your existing Timberline Software to process your payroll and produce reports. Keystone's experienced construction payroll specialists enter your timesheet data directly into your Timberline System from our remote processing center. By incorporating secure remote technology along with an advanced management process Payroll ToolKIT eliminates the administrative burden of your Timberline Payroll Processing. 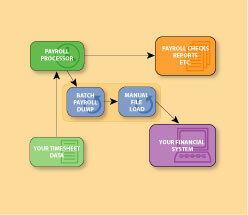 Since your payroll data always resides in your Timberline System, you are in control. Call us at 610-695-9303 to get your Free report on "Payroll Tools for the Trades" and learn how you can get back to building your business.